Home / News / Video / Weird / A giant lizard was found in the front door of this man's house, totally scary! 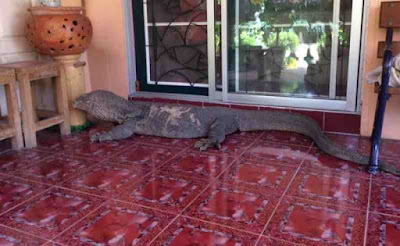 A giant lizard was found in the front door of this man's house, totally scary! It's normal to see a lizard roaming around your house, right? But, it's kinda freaky to see a GIANT LIZARD trying to enter your house! Watch what they did with this monster creature..
Lizards are often seen on our walls, ceilings and sometimes floors, but have your ever imagine seeing a giant lizard trying to knock on your door! It will surely freak you out and make you wanna scream and run fast! A very horrifying moment was caught on cam when a Thai family was shocked to see a very huge monitor lizard clinging on their front door. 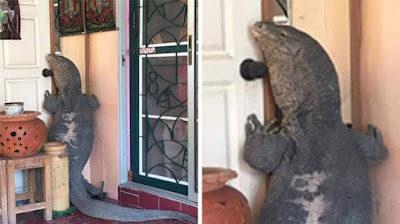 The man who was trying to remove the giant lizard on the door was Attanai Thaiyuanwong, from Nonthaburi, Thailand. He also posted the video of the 'monster' lizard on Facebook gaining more than 250,000 views and thousands of shares and likes. Attanai and his family went home to find the monitor lizard trying to enter their house, they attempt to get the lizard to move out of the way, you can also hear the lizard shrieking every time it swings its tail. You can see in the video that the 6ft giant lizard was leaning against the door while tugging at the handle with its mouth. The family dog kept on barking at the huge lizard while the family was heard sceaming in fear as the monitor lizard trashes it's tail on the nearby table. After discussing what to do with it, Attanai finally threw a rope of the monster creature and pulled it away. According to reports, the monitor lizard was living on site before the family moved in. And after what happened, the family said that the huge lizard periodically shows up at their home and good thing cause it's not fatal to humans. They even named it Selena!